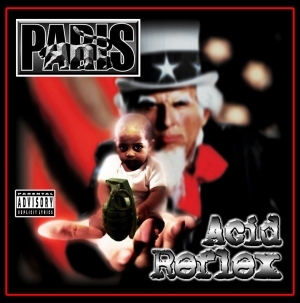 Just in time for the 2008 election, Paris returned to the mostly apolitical world of hip-hop to once again inject his patented form of sonic vitriol into the musical landscape with Acid Reflex. With commentary on a wide range of topics including black-on-black crime and violence, the ongoing problem of police brutality, illegal and immoral wars, the crooked arena of politics and the need for more of an equal balance between positive and negative influences in entertainment, Acid Reflex is the fifth installment of cutting-edge funk-and-rock-inspired hip-hop in a career spanning the sale of over 3.8 million units independently worldwide. The lead single, "Don't Stop the Movement," provides a scathing reintroduction to Paris' polemics, and serves as a stark reminder of the type of potent politically and socially aware commentary in hip-hop that has become less and less frequent as the art form becomes increasingly corporatized and diluted for mass consumption. Featuring performances by Rock and Roll Hall of Fame Inductee and Parliament/Funkadelic frontman George "Dr. Funkenstein" Clinton, Public Enemy leader Chuck D. and newcomer and Paris-protege T-K.A.S.H., Acid Reflex is a acerbic criticism of modern day American life, and acts as a rallying cry for the need for social justice, unity and awareness. From the sad state of Darfur and Congo, to America's legacy of aggression, to Katrina and religious fanaticism, it's all here. And the timing is perfect too - in an era where politics has become popular culture and the United States has finally elected its first black president - only a handful of artists with an international platform choose to seize the moment. Paris does. Continuing in the tradition of artists who can be relied upon to remain consistent with both content and dedication to musical quality, this fifth effort by Paris pleases not only his existing loyal supporters, but continues to gain him many new listeners as well.